Isaiah 7:13-14 is a prophecy concerning the virgin conception and the birth of the Messiah. This is perhaps the most controversial of the messianic prophecies and therefore requires a closer textual analysis than others. The exact meaning of this passage is disputed by rabbis, liberal theologians and even by some evangelical theologians. The sign: Since the context of the chapter requires a short range prophecy—giving a sign to King Ahaz—how can this be applied to the birth of a child some 700 years later, as claimed in Matthew 1:22-23? The Hebrew word "Almah": Does it really mean a virgin, or simply a young unmarried woman? We will deal with both of these contentious issues before proceeding to discuss the passage itself. Since Isaiah 7:13-14 requires an immediate sign to King Ahaz, many Evangelicals have taken this verse to be an example of "double fulfillment." This principle states that a prophecy may have more than one fulfillment. This verse may, accordingly, be both a sign for King Ahaz and the sign in Matthew 1:22-23 for the birth of Jesus. This author does not accept the principle of double fulfillment either here or in any other place in the Bible. If this principle were true, there would be no real need for the virgin birth at all. There is another, better principle of biblical interpretation which is "double reference." This principle states that one block of Scripture dealing with one person, one event, one time, may be followed by another block of Scripture dealing with a different person, place and time, without making any clear distinction between the two blocks or indicating that there is a gap of time between the two blocks. The act of a gap of time is known only from other Scriptures. There are, therefore, two separate prophecies side-by-side each having their own fulfillment, but with only one fulfillment per prophecy. "Double Fulfillment" states that one prophecy can have two fulfillments. "Double Reference" states that the one piece of Scripture actually contains two prophecies, each having its own fulfillment. Isaiah 7:13-17 contains two quite separate prophecies with different purposes, and having different fulfillments at different times. Na'a'rah—Na'a'rah means "damsel" and can refer to either a virgin (as in I Kings 1:2), or a non-virgin (as in Ruth 2:6). In Joel 1:8 it is used in reference to a widow. In Genesis 24:16, because the word does not exclusively mean "virgin" the writer adds the phrase "had never known a man" in order to clarify what he means. Again in Judges 21:12 the phrase "had not known a man" has to be added to give the precise meaning. Almah—Almah means "a virgin," "a young virgin," a "virgin of marriageable age." This word is used seven times in the Hebrew Scriptures and not once is it used to describe a married woman; this point is not debated. Genesis 24:43. In contrast to 24:16 mentioned above, verse 43 requires no additional qualifying remarks since the one word alone is sufficient to mean "virgin." Furthermore, it is used of Rebekah who was obviously a virgin at the time of her marriage to Isaac. Exodus 2:8. Used in reference to Moses' sister Miriam, who was a virgin. Psalm 68:25. Used in reference to the royal procession of virgins. Since the King in this context is God Himself, absolute virginity is required; it is unthinkable that God would allow unchaste, unmarried women in His procession. Song of Songs 1:3. The context here is purity in marriage. Song of Songs 6:8. The word is used here in contrast to wives and concubines who would obviously be non-virgins. Proverbs 30:18-19. The word is used in verse 19 in contrast to an adulteress in verse 20. Isaiah 7:14. Since all of the above six verses mean "a virgin," what reason is there for making Isaiah 7:14 the only exception? Since everyone agrees that almah means an unmarried woman, if the woman in Isaiah 7:14 were a non-virgin, then God would be promising a sign involving fornication and illegitimacy. It is unthinkable that God would sanction sin, and in any case, what would be so unusual about an illegitimate baby that could possibly constitute a sign? 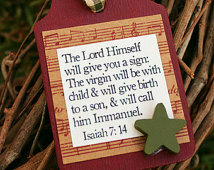 As far as ancient Jewish writers were concerned, there was no argument about Isaiah 7:14 predicting a virgin birth. The Septuagint is a Greek translation of the Hebrew Scriptures made about 200 B.C., 200 years before the issue of Jesus' Messiahship ever arose. The Jews who made this translation, living much closer to the times of Isaiah than we do today, translated Isaiah 7:14 using the Greek word parthenos which very clearly and exclusively means a virgin. There can therefore be no doubt that the unique event which God is promising as a sign is the miraculous conception of a son by a girl who is still a virgin. Therefore the Lord Himself will give you a sign: Behold, a virgin will be with child and bear a son, and she will call His name Immanuel (Isaiah 7:14 NASB).